Increase reproducibility with fewer hours in lab. Avoid vibrations from switching valves by hand. 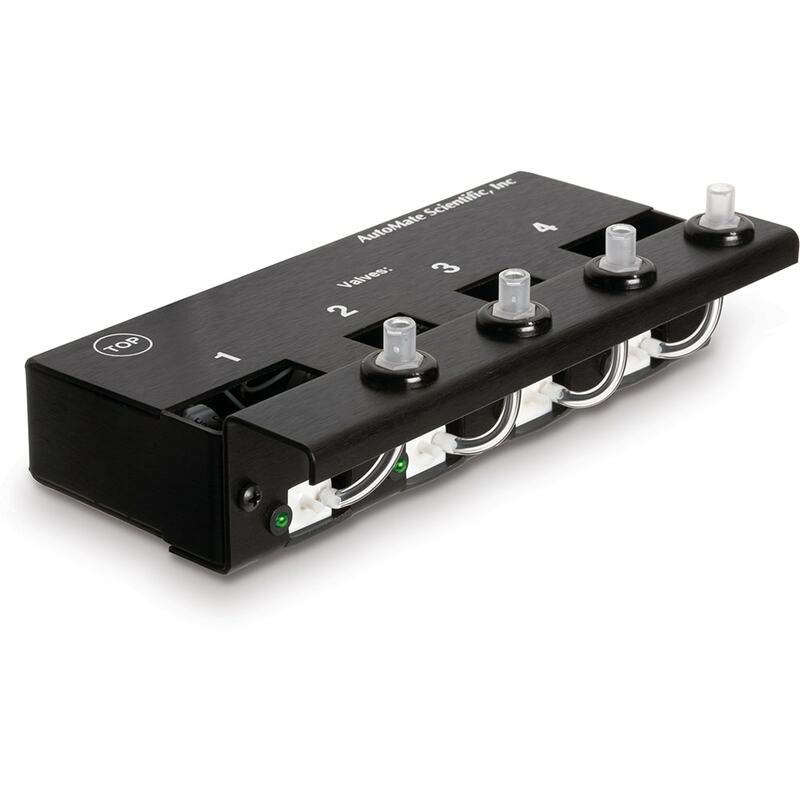 The ValveBank® or ValveLink8.2® controller handles all solution delivery so that you can watch results – not switch stopcocks. Many special features are included for easy perfusion control. Low noise circuitry. Valve switching is accurate to 0.01 seconds with programs up to 99 hours long under microprocessor control. Consistent liquid delivery means better data. Choose between speed, cost, and ease of cleaning. Several options are available for fittings and reservoirs. Flexible design. Easy cleaning and calibration. Slave mode valve operation controlled by your computer, pClamp, Pulse, Acquire, LabView, AxoGraph, etc. Scientific sells complete perfusion systems as well as individual components. This can make it confusing for customers to determine which pieces they need to order. We hope this guide helps. To customize or build your own perfusion system, get started here. Easiest valves to clean and switch tubing. Liquids never touch the valves. Switches in 30-50 ms. 1/32” i.d. silicone tube passes through, and is pinched closed by solenoid activation. All AutoMate Scientific valves include an individual indicator LED. Our new aluminum enclosure keeps the valves dry from spills and offers luer lock ports for syringe reservoirs. Required for fast kinetics applications. Excellent chemical and corrosion resistance. Non-stick surface resists particles and chemical deposits. Switches in less than 10 ms, with 20 μl of dead volume from port to port. Threaded female inlet and outlet ports accept Hose Barb, Luer Lock and Nut & Ferrule fittings (see diagrams next page). For the most demanding applications AutoMate Scientific offers tiny valves from the Lee Company. 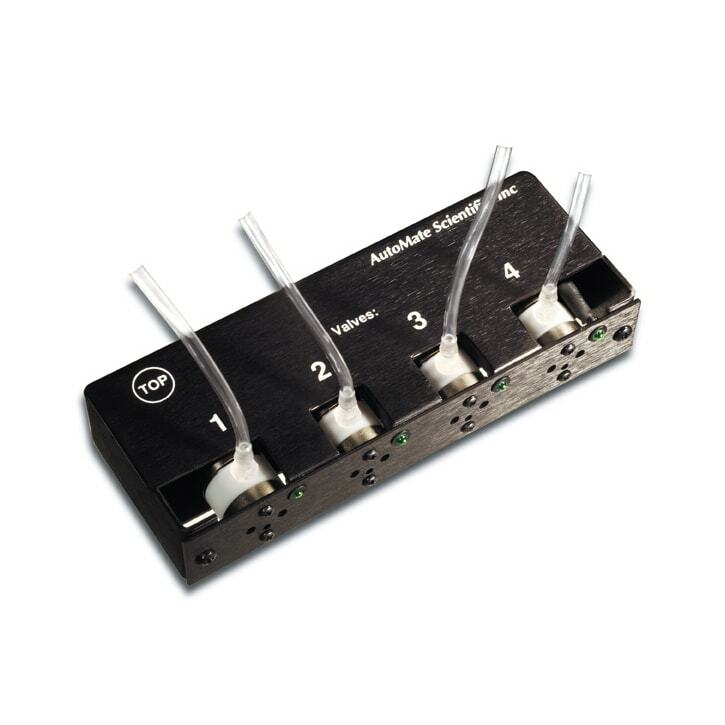 Enclosed in our new aluminum box with luer locks for syringe reservoirs, these valves can open and close in 1.5-4 ms with a ValveLink8.2 controller. 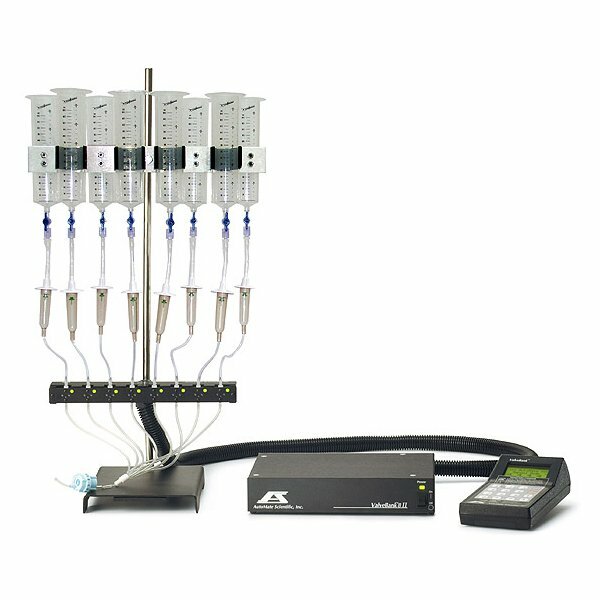 Perfusion systems can be controlled by a computer using data acquisition hardware (i.e., DigiData, IPA, dPATCH, EPC-9/10, LIH 8+8, or National Instruments board) and software (i.e., pCLAMP, SutterPatch, Patchmaster, or LabView). 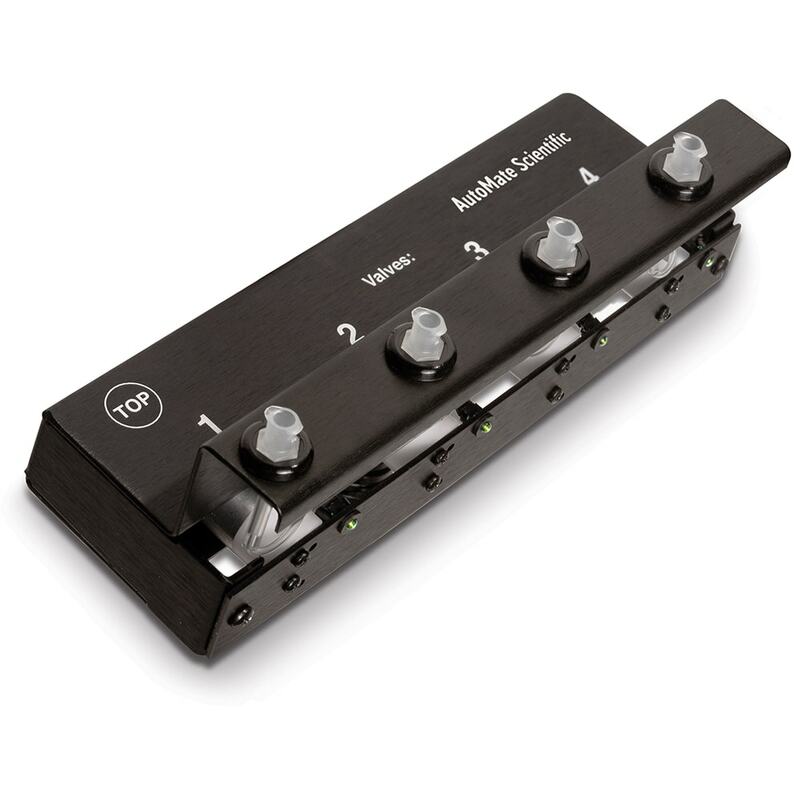 Both ValveBanks and ValveLinks accept real-time TTL inputs to control valves. Most acquisition software already being used in your experiments can talk to our controllers. AutoMate Scientific offers an optional program called EasyCode® for the Macintosh and PC/ Windows to program ValveBanks (not ValveLinks). This software is used before an experiment – valve sequences are downloaded into the memory of the ValveBank where they are run. An article by AutoMate Scientific can be found in Axon Instrument’s AxoBits 17 newsletter outlining these strategies – accessible on our web site. 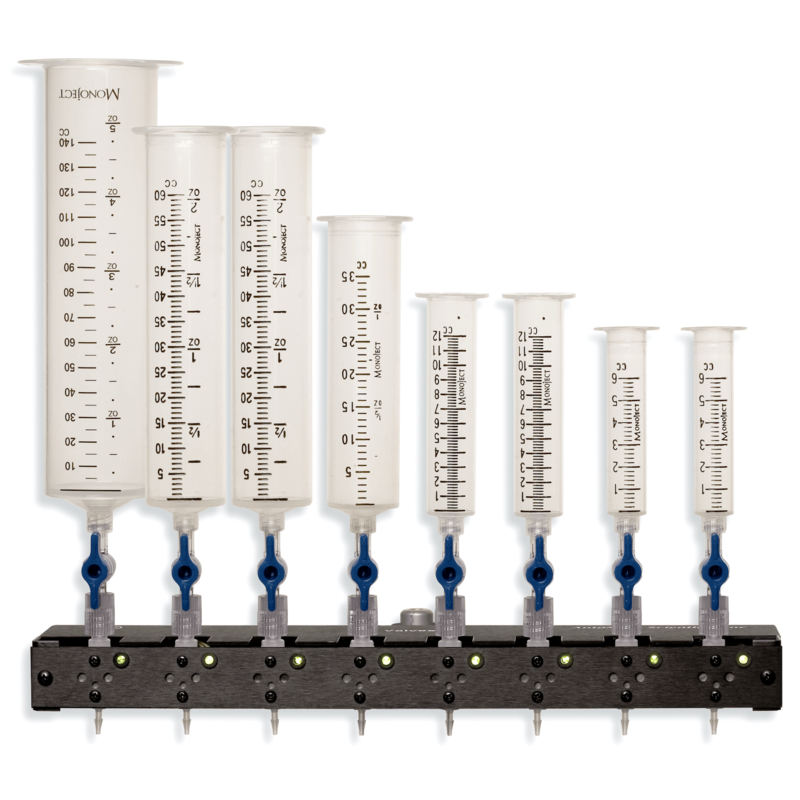 Controller, valves, 60 ml syringe reservoirs, 2-way stopcocks, ringstand, 1/16″ i.d. tubing and four-, eight- or sixteen-into-one micro-manifold with built-in flow control. Non-pressurized PTFE inert systems include drippers and a reservoir bracket. 5, 15, 35, 60 or 140 ml syringe reservoirs available. The Economy Pinch Valve System includes ValveLink8 controller, four pinch valves, 35 ml syringes, 2-way stopcocks, ringstand, 1/16” i.d. tubing and four-into-one micro-manifold with built-in flow control. Allow direct connection of syringe reservoirs for minimal dead volume. Available for 1/8″ and 1/16″ i.d. soft tubing. For direct attachment of syringes. Eliminates extra tubing between reservoirs and valves. Includes 2-way stopcocks and 35ml syringes. HPLC-like, screw-in fittings for rigid, small-diameter (1/16″ o.d.) tubing.